Wondering how to get your kids to exercise more in the winter? Discover indoor rock climbing for kids! There are a ton of mental and physical benefits to introducing your children to climbing, and when it comes to indoor rock climbing, sacramento has some of the best jr. climbing experiences around. Kids rock climbing is similar to adult rock climbing. And the benefits are similar too. Not only are there physical benefits, but mental as well. Talk about a workout! The number of calories burned rock climbing is going to be different with each child, but the real benefits come from the functional fitness training inherent to indoor rock climbing. Climbing indoors trains the core and upper body muscles, but also works balance and flexibility. It’s a misconception that rock climbing is all about upper body strength. Sure that’s a part of it, but real power and endurance comes from having good balance, and the flexibility to reach the legs up and push your body up the wall. Kids can get lost in the excitement of climbing, and spend hours pushing their little bodies to the max. Plan on bringing a small snack, such as a granola bar or piece of fruit, so your kids can power up and push through when they start to get tired. 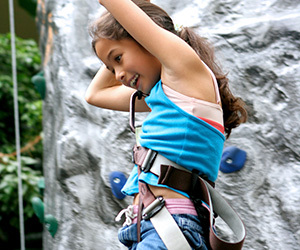 Indoor climbing gyms allow kids to build confidence and overcome fears. The harness that holds your child provides a safety net in case they fall off the wall, and makes it easy to take calculated risks without the consequence of injury. Reaching new heights and progressing up the levels of difficulty create a sense of accomplishment, and an appreciation for hard work. It’s always a great day when we can help our children learn that the best things in life are often the things we work the hardest for. And indoor climbing is a great way to instill that value, along with a side of good old fashioned fun.